The DS X E-Tense concept. 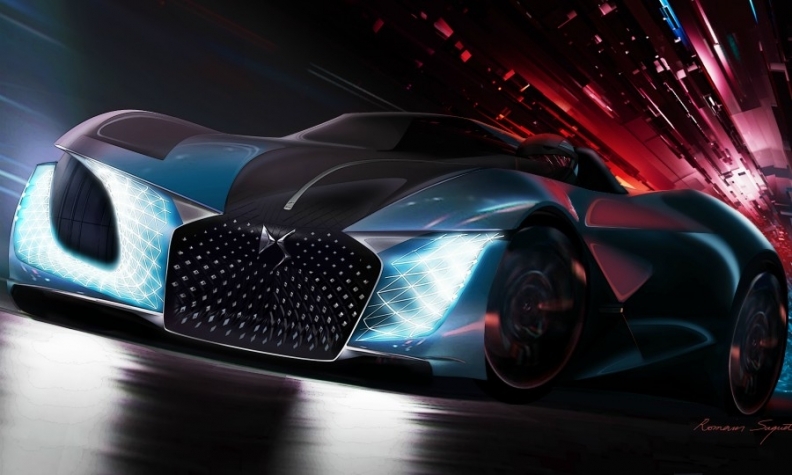 PARIS -- PSA Group's upscale brand, DS, has shown its vision of what a French luxury car might look like in 2035 with the DS X E-Tense concept. The inspiration for the three-seat electric vehicle was a motorcycle with a sidecar, said DS design chief Thierry Metroz. The concept exists only as a film and a design study and is asymmetrical. On the right side a covered "cocoon" accessed by a gullwing door is meant to be used by up to two passengers in autonomous mode, with no steering wheel or controls. On the left, an open cockpit allows a single driver to experience all the sensations of manual mode. The front and rear are also asymmetrical, with the grille offset to the left directly in front of the open cockpit, and the rear axis is on the right, following the passenger compartment. The vehicle would be powered by two electric motors, producing 540 hp in normal mode, with a “circuit” mode that pushes power to 1,360 hp. A carbon fiber chassis has a translucent floor under the passenger compartment. An active suspension system engineered by DS’s Formula E program controls handling. “At the beginning of the project we imagined a car with only three wheels,” Metroz said in an interview at the brand’s new design center outside of Paris. The idea was shown to Xavier Mestelan, the head of DS’s Formula E team, who said that a high-performance car couldn’t have three wheels, so a somewhat more conventional layout was adopted, Metroz said, although with an asymmetrical wheelbase. The DS brand was separated from Citroen in 2014, and until this month, DS designers and stylists worked alongside of those at PSA’s other brands at PSA's technical center in Velizy, France. The DS 7 Crossback, which has just reached the market in Europe and China, is the first vehicle designed specifically for the brand. A new model will be released in each of the next five years, PSA says. The DS X E-Tense is a product of the brand’s Vision 2035 initiative, on which product planners, designers and marketers at the brand collaborated. “We wanted to imagine how we could live with cars in 2035,” Metroz said, when autonomous and manual driving will co-exist. "With this concept it's possible to merge the two possibilities."